Jingle da bells, jungle bellz, jingle da bellz. Stop. Swine-rewind!!!! Ya know it! It’s da pig coming at ya like a Lidl Stollen! I bin getting the monies in ready fo Christmas coz I want to treat ma nan to a fierce foot spa dey got on special down at Boots. She totally worth it bruv! Anyz, ‘ere’s da latest festive stampin’ tunez all wrapped up just fo youz. Bradford Moped Group – Stop! Carry on. Spatch! – No honestly Claire, I’ve always wanted a slanket. Lovely. Can’t breathe in dis thing! Whoooooo…. WhoooOOOOooooo…. WhhhoooooooooOOOO! Nah, is not a ghost! Is me, Disco pig coming atcha like spooky pair a dungarees! Totally! 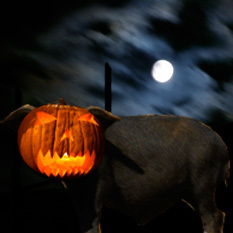 Disco pig, he loves Halloween coz he gets to do some of that Trick or Treatin’. Last year, some geezer on da posh estate, he bin tellin’ us that we not getting no treat, so we came back later and we treat us to his car keys! He be handin’ out da Haribo like a good boi dis year me think! Disco pig also be playin’ up at the community centre lataz at the annual Monster Mosh, and here are some of da hauntin’ hoof hammerers me be playin! The Jason Voorhees Ensemble – Why can’t I just meet a nice lady and settle down? Want a bit of that! Hoopla hoopla hoooooopla! Snout! Snout! Wiiiiiggieeeeeee! Nice, intro there I reckon! How’s it goin’ ‘me trotter tribe? 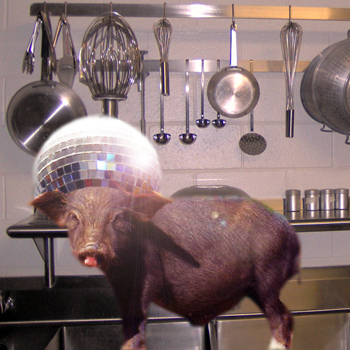 Disco pig be here spinning ‘d platterz what matterz! Well I have been spinning platterz coz Disco Pig get himself a cushy job down at Nando’s. Peri peri nice! I been workin’ and savin’ up for a sweet lookin’ scootae to impress ma sly sty friends. Dat’s ‘d ladies init! Dey be lovin’ a pig wiv wheels. Lexus Teaspoon Massacre – Got any two-stroke mister? The Barely Bare Bears – Quick Louise! 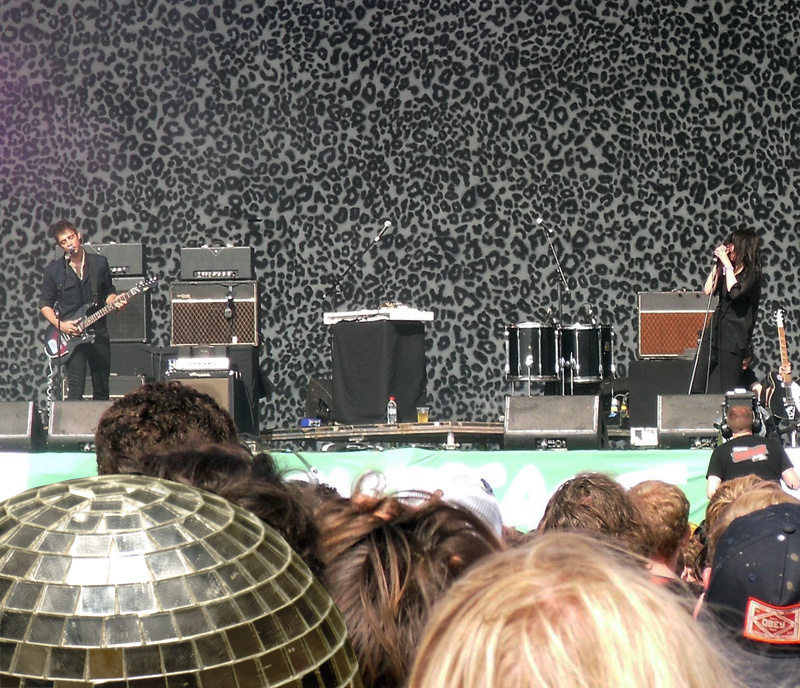 The microwave’s on fire! Thinking Lizards – Has Brenda found that pair of ornamental bees yet? Backed a Wrong ‘un – Yes! Yes! Yes! Aw come ON! Diggin’ da piggy! Diggin’ da piggy ! Diggin’ da piggy! SWINE-OVERLORD! 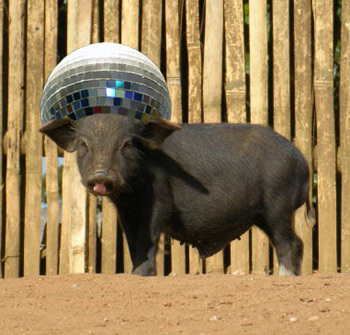 Ya, das right, it Disco pig comin’ atcha like a bag of Fruitella! 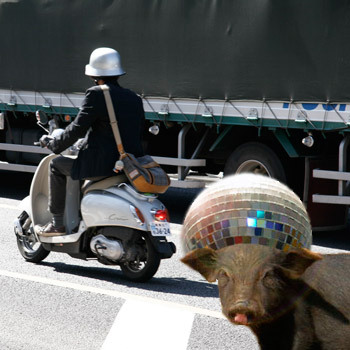 Me and ma pig-brudda’s be all tearing up da clubs fo sho and Disco pig, he been spinning da platterz wot matterz iniit? In fact, Disco Pig been spinnin’ other platterz coz he been doin’ Come Dine Wiv Me on the T of V. Last night, Disco Pig had Delroy Pearson from Five Star, Vicki Michelle from dat Allo, Allo and Leonard Fenton who is Mister Dr. Legg from da Eastenders. Disco Pig won wiv his Moroccan inspired Kefta and chips. Dat some tasty dish I laid on them muthas. Fenton was well gutted. 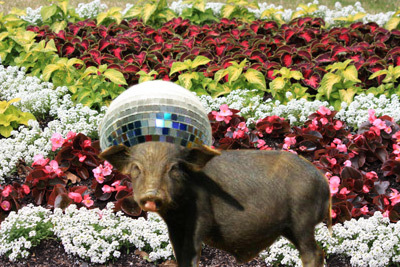 Anywayz, time for Disco Pig to give out me musical advice from his bass-bin of tail-twirlers. Dis gonna mess ya right up! Disco Pig rock at connecting four… chang! chang! Chang, chang, chang…badawhoop, badawhoop. Ayeiiie it me, Disco Da Friggin’ Pig back in da house to spin you some more of me bangin numbers, my little lean back bacon butties. Gloop, Gloop! What has de world famus Disco Pig been doin dis last week I hear you grunt? Well, woz no more my little mucky piglets cos I iz here to tell ya. Pin ’em back cos here it is. 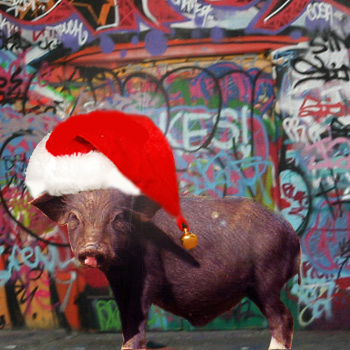 Da Disco Pig’s sista, Nightclub Pig came round ma crib last week wiv her little porkers. Dey is da bomb, but still young and finding der trotters in dis difficult world of ours ya know? Anydeways, dey got out da connect four and we had a battle in front of Cash in de Attic on da tellybox. Dem young porkers stink at connecting fours and Disco Pig beat em up bad, real bad wiv a 3-1 win in a best of five…Hah Disco Pig is da boss hog! Chill time now bloods – here is ma selection of top toons from da music scene this week, so burn up a spliff and enjoy – chang, chang! Gullible Seagulls – Would you stop rubbing it now, Nigel! More hoof-tapping toons next week yer hear me now?